﻿1.Preheat oven to 350 degrees. 2.Heat the oil in a large skillet. Add mushrooms and onions and cook, stirring until the onions are browned. 3.Stir in the barley, salt & pepper to taste. Stir in 1 cup of the cheese and set aside. 4.Rinse the bell peppers. Slice in half from top to bottom. Remove and discard the seeds and pith. 5.Spread the marinara sauce on the bottom of a 9 X 13 pan. 6.Stuff pepper halves your mushroom and barley mixture. 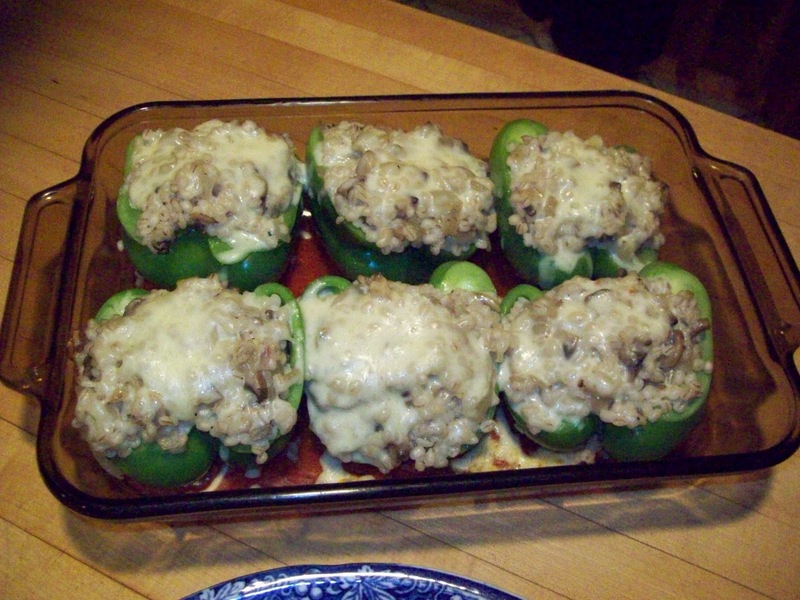 7.Sprinkle tops of peppers with remaining 1/2 cup of cheese. 8.Tent the pan loosely with aluminum foil. 9.Bake for 30 minutes or until the peppers are tender. I love that I created this recipe myself and that you can change the flavor by changing the cheese to whatever you have on hand. When cooking the barley for this dish I like to add 1 Knorr vegetable boullion cube to the cooking water. This sounds like someting my husband would LOVE.